From soup to nuts, from turkey to trifles, we are done. With family both near and only slightly-far, the Christmas holiday stretched over a number of days, our merry band of revelers moving from house to house, from city to city, in celebratory caravan. The journeys and visits rushed by in a blur of sparkle and shine, with spirited carols and a chorus of laughter our theme. In that wonderful blur there were moments, those treasures in time when your breath catches and click, it's forever in your memory. A tree groaningly, gloriously laden with ornaments, most especially at the precise height of a three-year-old who is thisclose to turning four. A pair of slender glasses that chimed when clinked, filled with berry-hued bubbly drinks to be sipped over the quiet hours of mid night. That bite of shortbread cookie, swirled with raspberry jam and finely chopped almonds, buttery and tender and tart and perfect. Full, happy days they were. After all of that joyous hubbub, the time that follows seem quiet. But is a lull that is not without its own particular charm, as anticipated as the holiday itself. These plaid flannel pajama days are not meant for rushing about, but for settling in. The first day after our celebrations Mother Nature granted us the gift of the First Proper Snowfall we've had this winter, amounting to far more than all of the dustings we'd had up until that point. Out our windows all was white, white, white, with the spiky tips of evergreen poking through the backyard drifts here and there. Once finished with the business of the obligatory snowball fight and tromp through the powder, we were content to retreat to the house, with excuse to spend time on the comfy couch by the fire, warming ourselves with a blanket pulled up to our laps and a snacks nearby. Yesterday, the snack was popcorn to go along with movies. It's another tradition of our family - someone (usually that's plural) always gives someone else a movie (also often plural) in their stocking, watched after a lively debate as to the order in which they shall be screened. Ensconced upon the aforementioned couch, these movie marathons require a snack that can be eaten out of shared bowls with little messing about. This popcorn fit the bill nicely. It was inspired by the famous spiced nuts served at the bar of Union Square Café in New York, and the result was highly-flavoured and equally-addicting. Spiky needles of rosemary, fitting for the season I thought, were chopped into the tiniest of evergreen specks and then combined with crunchy Demerara sugar. A sprinkling of cayenne and salt added heat and savoury depth to the mix. As the adornment for mounds of hot, buttery popcorn, the combination was met with murmured praise as everyone's mouths were stuffed full. Just in case I don't see you before Friday, all my best wishes to each of you for the coming year. 2010 looks singularly grand on paper, don't you think? Let's make sure it lives up to that. Until then, if you need me, the end seat, closest to the fire, is where you'll find me. By the way, did you know that theMenu for Hope campaign has been extended until December 31, 2009? You can still bid on raffle items, here, with full details on how everything works here. And oh! I have added more items to my personal contribution to the effort, raffle item CA03; I will be including some vintage copies of Gourmet magazine along with paper ephemera from lovely design in my collection of a few favourite things. Please consider these measurements a rough guide, and more of a suggested combination of flavours. I like the inclusion of a healthy pinch of red pepper flakes at the end; the capricious flecks of firecracker heat add an element of (mild) danger that makes this more than just a mindless munchable. 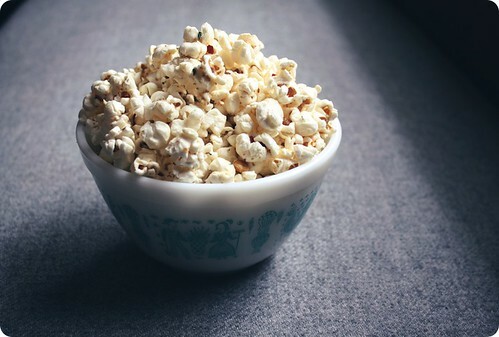 While your popcorn is popping, mix together the rosemary, Demerara sugar, salt and cayenne in a small bowl. Set aside. 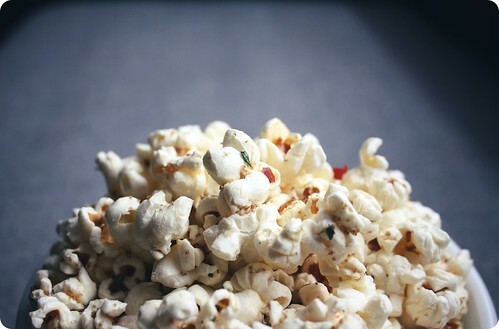 With the popped popcorn in a large bowl, drizzle a some of the butter over the top and toss to coat. Repeat, drizzling and tossing, until all the popcorn is coated. Now continue this process with the spice mixture, scattering on some, then tossing the popcorn lightly, then adding more until it is evenly seasoned. Sprinkle over the red pepper flakes, if using, and serve. • If you do not have Demerara, turbinado or raw sugar would be best. Do not use brown sugar or Muscovado instead; Demerara lacks the sticky quality of those, and you need something granular here. • The recipe for the original spiced mixed nuts can be found here, via Nigella Lawson.